Henderson Hall is situated on Southgate Road on the southern border of Arlington National Cemetery, next door to the Army’s Fort Myer. 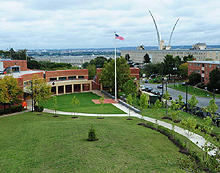 The Pentagon is a short distance to the east, with the Navy Annex just to the south. Built on land acquired through deeds and other actions between 1943 and 1952, Henderson Hall officially became U.S. government property on February 15, 1954, when the governor of Virginia executed a Deed of Cession of Political Jurisdiction.